Five nights at freddy's 4 - the final part of one of the most popular horror games. The map is based on the trailer, which you can see recently. You can download the first release from the link below, which consists of a map and a few mobs. The second release will be on August 31. The map will be finalized and contain of the plot. The third release will include a full set of multiplayer games. Do not put and not to break blocks. Set the brightness to low. Pocket Nightmare Demo folder to move to / games / minecraftWorlds /. Restart block launcher and go into the "Pocket Nightmare" world. PocketPower v1.1: Release of a new versionRyan (12 bit) - the author of Redstone mod for Minecraft Pocket Edition began to develop a new version of the addon! Factorization mod 4.0 for Minecraft PE 0.10.5Huge update of the most popular mod - Factorization! This update was added voltage, the new variety of wire (copper, gold, etc. ), resistance, and transformers. 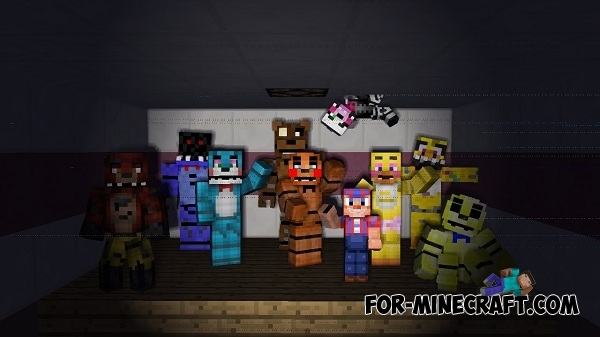 Five Nights At Freddy map for MCPE 0.10.XThis is the original map of the popular video game FNAF, in which you are working as a security guard pizzeria.